When traveling, whether for business or for pleasure, you can still enjoy the benefits of feng shui. You might have even noticed that enjoy your travel more (or less) when you travel to certain places that are in one direction. Maybe you find that you enjoy travel equally well, but more so to some places than others. For some, Asia might draw you and for others, it might be Europe. No matter where you like to travel to best, or if you would like to enhance your travel luck, feng shui can help you enjoy a safe trip and take you to some of the destinations you’ve always dreamed of! Unlike sitting and sleeping directions, determining travel feng shui directions that are auspicious or inauspicious is based on where you are traveling from, rather than where you are traveling to. Say for instance that you are an east group person living in Dallas and you are traveling to Los Angeles. You would say that looking from Los Angeles you will be coming from the east. This is a good direction for an east-group person, but not for a west group person. In the case of the west group person flying to Los Angeles, some practitioners recommend making detours, such as flying from Dallas to Miami and then to Los Angeles for the west group person. However, this just isn’t practical. Instead, concentrate on facing your good directions in meetings, etc., once you have arrived at your destination. If a detour is possible, such as when you are driving somewhere, then take it if you can. If it’s been too long since you poked your toes in some sand or went on an adventure, all you need to do is activate the northwest corner of travel and helpful people. Add something moving here to help you pack your bags. A mobile, a clock, fan, or kinetic sculpture is all you need to get your travel chi moving. A conch shell or a pretty metallic object can also help boost your travel energy. For an extra kick of travel chi, add pictures of the places you’d like to visit. Hotel rooms have many people visiting, so when you’re on a trip, bring a travel symbol such as the conch or cowrie shell to give you protection, create smooth relationships while traveling, and a feeling of harmony and contentment. Freshen up your room with a travel candle in a nice natural scent, such as lavender to freshen up the room and give it a boost of yang energy. Because you’re out of your usual surroundings, it’s a good idea to think protectively. Pack some TSA-approved travel locks to lock your luggage, tie a red ribbon around your suitcase handle, and carry a red scarf. Make sure tote bags can be zipped securely too. 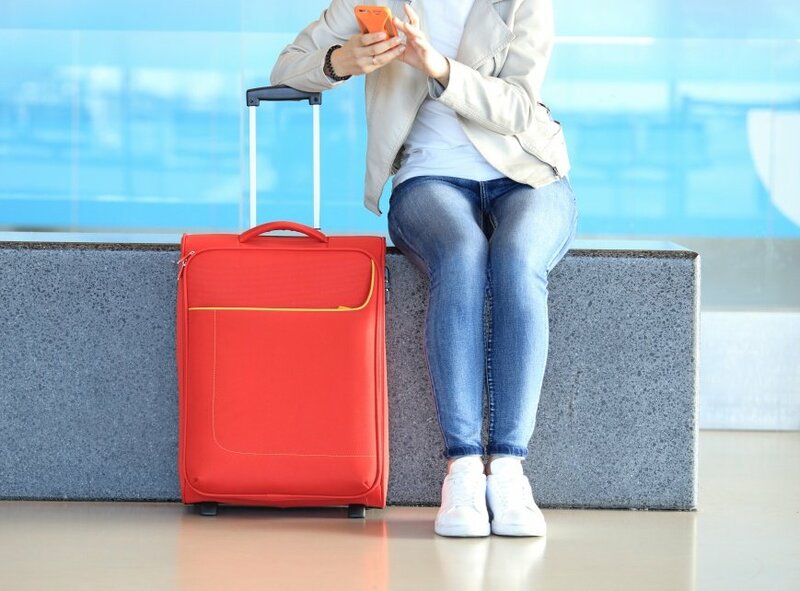 Red luggage will also be easier to find and the red color protects against theft. The following are travel rituals that you may want to try the next time you are traveling. These are part of symbolic feng shui and are designed to correspond to the elements as they relate to compass directions. For travel to the South: Drink one glass of water or wash your hands before leaving the house. For travel to the SW or NE: Swipe the air with a branch from a tree or bush in the direction of travel. Do this three times. For travel in the W or NW: Light a candle (red is best) or some incense, pointing them in the direction of your travel. For travel in the E or SE: Ring a bell six or seven times in the direction you are traveling just before you leave. For travel in the N: Put dirt in a small cup and throw it in the direction of north. You can also point a quartz crystal in this direction. For travel to the South: Wave a branch with leaves and that has been tied with red thread in the air three times before starting out. This is to ensure good travel luck and good business relations. For travel to the SW or NE: Light a candle or some incense and hold them up in the direction you are heading as you are packing and about to leave. For travel in the W or NW: Throw dirt or sand in the direction of travel as you leave the house. For travel in the E or SE: Throw water in these directions as you leave the house. For travel in the N: Ring a bell three times as you are leaving. Ring it in the north direction.